Geographers who are Hungary like to eat Turkey, provided it does not have too much Greece. The first in this Thanksgiving series of posts looked at how the first Thanksgiving was actually held in Mexico, and not the USA as more commonly claimed. Many of the essential ingredients of the modern Thanksgiving feast also originated in Mexico. In this post, we take a look at the origins of the Thanksgiving (and Christmas) turkey. How did the turkey eaten at Thanksgiving and Christmas acquire the same name as a European country? Or was it the other way around? Modern day turkeys (the edible kind) are the direct descendants of the wild turkeys (Meleagris gallopavo) still found in many parts of Mexico. So, how is it possible that a Mexican bird acquired the name turkey? The most likely explanation derives from the fact that the merchants who traded in the Middle Ages between the Middle East and England were based in the Turkish Empire and hence known as “Turkey merchants”. Turkey merchants are also believed to have introduced the guinea fowl, a native of Madagascar, to European dinner tables. Later, the larger New World bird, the present-day turkey, was brought back to Spain by the conquistadors. The rearing of New World birds gradually spread to other parts of Europe and North Africa. The Turkey merchants capitalized on the new opportunity, and began to supply the new birds instead of the guinea fowls to the English market, and the rest is history. The first use in English of the word “turkey” to describe the bird dates back to 1555. By 1575 , turkey was already becoming the preferred main course for Christmas dinner. Curiously, the Turkish name for the turkey is hindi, which is probably derived from “chicken of India”, perhaps based on the then-common misconception that Columbus had reached the Indies. 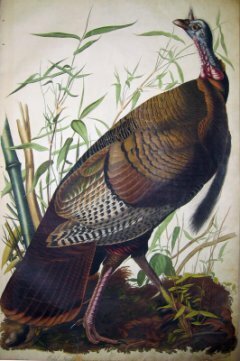 Mexico’s wild turkeys had been domesticated by pre-Columbian Indian groups long before the Spanish conquistadors arrived. Several archaeological sites provide tantalizing clues as to precisely how turkeys were reared. One such site is Casas Grandes in the northern state of Chihuahua, an area where modern, large-scale turkey-rearing is still an important contributor to the local economy. Geo-Mexico: the geography and dynamics of modern Mexico is your handy reference guide to all aspects of Mexico’s geography. If you have enjoyed this post, please consider gifting a copy of Geo-Mexico to someone this holiday season.